JD.com, China’s leading e-commerce company, is stepping up its the imported wine arm with what it calls a, “one-stop service” that boasts direct sourcing from wineries to Chinese consumers, JD.com’s worldwide global procurement department head has revealed to dbHK. With 302 million users, JD.com sold 40 million bottles of wines in China last year, led by France with a 36.4% market share and then followed by wines from China (23.9%) and Australia (19.9%). Without revealing the total sales value, volumes grew sevenfold compared with 2010, according to Max Cao, general manager of Global Procurement at JD Worldwide, a cross-border e-commerce platform launched by JD.com in 2015. JD.com Worldwide, similar to Tmall Global operated by its arch competitor Alibaba, allows overseas producers to sell directly to the mainland market without keeping actual stocks on the mainland. In its most ambitious move yet, the company has decisively stepped up its efforts to import directly from wine regions and wineries, cutting back on importers and middlemen. At Vinexpo next week, the Chinese e-commerce giant plans to make contacts with more wineries and producers at the three-day trade fair. “We are hoping to make more contact with the trade. Many people in the wine industry probably did not know we operate such a wine model, or that we can directly import from wineries, and they don’t have to worry about customs clearance or logistics. This is a model that ships wine directly from a winery to Chinese consumers,” explains Cao. The company claims it has already established strong relationships with wineries including Domaine de la Romanée-Conti, Petrus, Château Lafite Rothschild, and Dom Pérignon, as well as Treasury Wine Estates in Australia, Concha y Toro from Chile, Robert Mondavi from the US and Peter Mertes from Germany. According to the e-tailer, the advantage it has over its competitors is the one billion mobile users, on top of JD.com’s existing 302 million users, that shareholder Tencent can provide. Mobile provider Tencent has a 15% stake in JD.com and operates China’s most popular messaging app WeChat. “We can help brands market offerings to 302 million customers, who are the growing Chinese middle-class and millennial consumer groups. Our partnership with Tencent further enables us to reach over one billion consumers in China. We’re able to use deep insights gained about consumer shopping habits to precisely target customers and help brands access new audiences,” he added. 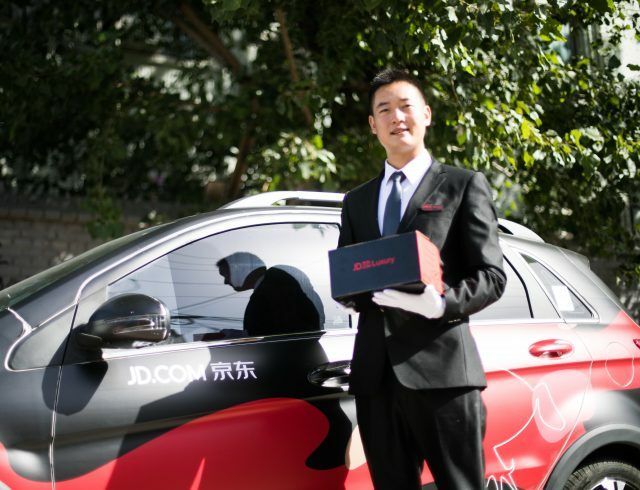 JD.com launched a premium delivery service for customers who ordered fine wines on the platform, which is available in nine cities across China. The move is partly motivated by counterfeit or copycat wines appearing on online platforms, which by direct sourcing, says the company, would guarantee authenticity. Asked by dbHK about due diligence the company applies on other third party shops on the platform, the company said if a shop were found to be selling counterfeit wines, it would face a significant fine, and the company would turn over the shop to police if criminal activity were suspected. 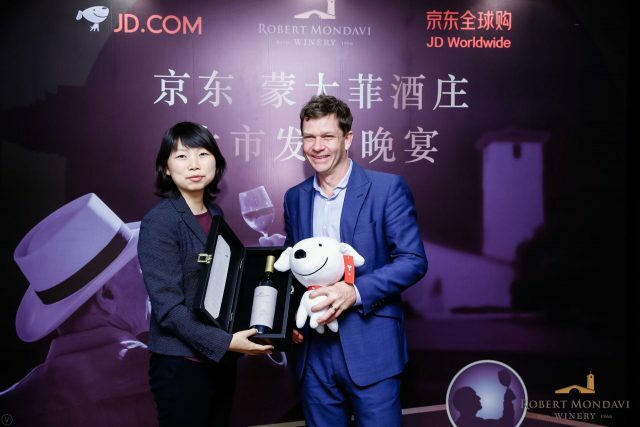 In addition, the company now requires third party shops to provide a proof showing that the winery has given them distribution rights to sell their wines, while admitting that in the past, the platform had faced counterfeit problems with Château Mouton Rothschild, Penfolds and DBR Lafite wines, according to Cynthia Yang, director of Global Wine & Spirits Procurement at JD Worldwide. In terms of the wines JD.com is trying to add to its portfolio, both executives stressed the company was after wines that “suit Chinese palate,” an elusive term that seems to be changing with more younger consumers and millennials using the online platform. Citing an example, Cao revealed one of the surprising changes was the sudden surge of interest in Port wines, which, on occasion, have sold out due to popular demand. “We are actually selling a lot of Port wines from Portugal, and we often run out of stocks. It’s actually a very new wine concept for consumers but it’s very popular,” he explained, adding that the majority of the wines sold on the platform range between RMB100 (US$16) and RMB200 (US$31) a bottle, with the most expensive going up to RMB 60,000 (US$9,400) for a bottle of something like Domaine de la Romanée-Conti. The majority of JD.com’s wine consumers were born in the 1980s, making up 37.47% of all wine consumers on the platform. Cao, however, did not reveal how much wine contributed to JD.com’s overall alcoholic beverage sales last year but confessed that Baijiu, the country’s fiery liquor, still leads domestic online sales.